It isn't a new thought that the culture, ideas and values that go into building and shaping a city establish an urban form that instills the same culture, ideas and values in the citizens that grow there. Aristotle wrote about it thousands of years ago as he considered how different urban designs shaped cities as well as the people who lived in them. He was interested in relations between culture, urban design and civilisation, he wanted cities built to produce what he considered to be the best Greek society. He prized and valued equality and fairness and democracy. Not every person prioritises those values. What happens to a city that is built according to other values? And what effect do different city types, cities with different personalities if you like, different morphologies, have on the people who develop and grow up in them? Many cities have big egos. Maybe they care more about the way they look from the outside, rather than how they feel for those living on the inside. Imagine a city that is shaped by a culture of narcissism. The term narcissism comes from the Greek myth of Narcissus, a handsome Greek youth who rejected the desperate advances of the nymph Echo. These advances eventually led Narcissus to fall in love with his own reflection in a pool of water. 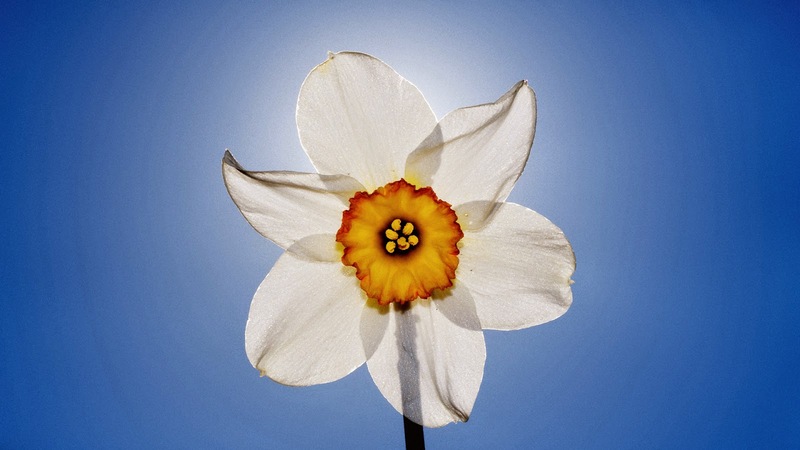 Unable to consummate his love, Narcissus "lay gazing enraptured into the pool, hour after hour," and finally changed into a flower that bears his name, the narcissus. While mirrors are a superficial part of this story, the parable and ideas are much deeper. These are the traits of a narcissistic individual. But unless that person has the power of - say - Adolph Hitler, Joseph Stalin, Margaret Thatcher (famous politicians with narcissistic personalities) - then it is unlikely they will influence a city or world history - beyond their own families. But is it that simple? ....what typically drives them is a lust for power, prestige, status, and authority. These (let's call them) "objects of admiration" not only gratify their need for self-aggrandizement by feeding their oversized ego. They also provide them with compelling evidence to confirm their sense of superiority to others—probably their most coveted need of all.... There's little question that politicians—wield vastly more power and control than the average citizen. Even before winning office, these individuals may have been inclined toward such "entitled thinking." But there's little question that once elected their newly elevated status promotes further exaggeration of this tendency—which, ultimately, must be seen as anti-social. As politician the whole city has become one huge "narcissistic supply" for them. That is, the ego gratifications available simply from residing in City Council are truly extraordinary: such an unusually prestigious role can't but pump up their self-esteem to levels that further confirm their bloated sense of self. Whereas before they put themselves on a pedestal, now the whole city obligingly seems to follow suit. Moreover, once ensconced in office they may well feel accountable to no one but themselves—free to play their competitive power games with impunity (and frankly, the public be damned). Beyond such pragmatics, implicitly believing that it's better to receive than give, narcissist-politicians' immense appetite for flattery, praise, and adulation is also abundantly gratified. Quite independent of professional achievement, they expect to be treated as superior. Their fragile psyche demands being admired and looked up to—and unquestionably holding high office almost guarantees that this ego requirement will be amply met. Such an enormous "fringe benefit," helps explain why so many of them become "career politicians," holding onto such psychological blessings as long as possible. In such instances, the chief reason for remaining an incumbent isn't to fulfill any idealistic aspirations. It's to "secure" their inflated self-regard. But while they may delude themselves that their city sorely requires their unique talents and skills, they experience little motivation to serve the citizenry as such. They've won their position primarily to serve themselves—and they can do so almost obsessively. The saying "Promises are made to be broken" rings particularly true for them. It's become almost a joke that the devout pledges they make on the campaign trail bear only trifling resemblance to what they do once in office. The ability to convince voters that they'll best represent their interests is what defines their success. Actually implementing what they avowed they'd tirelessly work for isn't really an essential part of their agenda—which is typically well-hidden from constituents (and many times from their conscious selves as well). In short, their campaigns measure how well they can dupe the public, not how well they'll fulfill their responsibilities once declared victorious. Notorious for being empathy-challenged (though they may be extremely adept at masking this deficit), narcissist-politicians are frequently tone deaf as regards how some of their private, "entitled" actions can affect public opinion. Compartmentalizing their lives, they suffer from a peculiar moral myopia and lack of imagination, unable to anticipate how their sexual infidelities, or other behaviours, might be held against them. In this sense, their exaggerated sense of privilege frequently undermines their better judgment. As cold-hearted and calculating as they can be—for they see others as essentially objects to manipulate for personal gain—they're strangely naive (or even unconscious) about how their unprincipled acts could be negatively interpreted by others, who don't necessarily assume such behaviors as "entitled" at all. Frankly incapable of emotionally identifying with others' distress, the wrong they may have done them remains forever out of their focus. What is in focus for them is the deeply felt assault to their self-image that comes from being charged with wrongdoing. And, so threatened, their push-back reactions are self-righteously contrived to reclaim both their personal and ideological superiority over their attacker. Flagrantly falsifying facts and details beyond reason, they vehemently proclaim the moral high ground. Sound familiar? I know it's over-written and exaggerated stuff, but I've included it here to flesh out the overall argument I am making. Some authors have argued that leader role modelling is the most critical factor determining ethical culture (Dickson , Smith , Grojean , & Ehrhart 2001 ; Morgan, 1993; Murphy & Enderle, 1995; Nielsen, 1989; Schein, 1992; Sims & Brinkmann, 2002). Jackall (1988) suggested that ethical behaviour in organisations is often reduced to adulating and imitating one’s superiors. Lord and Brown (2001) claim that leaders provide a ‘natural source of values’ for their employees while Bandura (1977), in discussions of socialization and social learning theory, suggests that employees imitate the values stemming from their leaders. Hood (2003), who looked specifically at the relationship between the CEO’s leadership style, values and the ethical practices of the organisation, found that leadership styles do influence ethical practices in the organisation. Brown, et al. (2005) considered managers to be a key source of guidance for ethical behaviour. Given this strong relationship between leadership and moral identity, we argue that if the management-control nexus exhibits narcissism, then it is probable that the individuals and the organisation as a whole will reflect these narcissistic tendencies. So, what does a narcissistic organisation look like? Duchon and Drake (2008) have argued that an organisation’s identity operates as an analogy to an individual’s personality and essentially determines its moral behaviour. They even go so far as to claim that an extreme narcissistic organisation cannot behave properly because it does not have a moral identity. This is because the organisation’s identity does not contain a predisposition to act virtuously and so it is morally flawed. Narcissistic organisations use ego-defence mechanisms to protect the integrity of its personality even at the expense of sacrificing the morality of its actions (Ketola, 2006). They become self-obsessed and use a sense of entitlement, self-aggrandizement, denial, and rationalisations to justify anything they do (Duchon & Drake, 2008). In such organisations, individuals and groups may be responsible for making decisions but those decisions will tend to be consistent with the larger system’s moral identity (G. R. Weaver, 2006) and so unethical behaviour can emerge unintentionally. This may explain how in the (New Zealand corporate) cases individual decision makers in senior positions did not question blatantly unethical behaviour. Let's take the narcissistic organisational characteristics identified by Grant and McGhee: denial, rationalisation, self-aggrandisement, attributional egoism, entitlement, and anxiety, and consider how Auckland City fares as a case study, just looking at sewage. Denial Nobody gets sick from combined sewer discharges into the Viaduct. The Waitemata Harbour is a beautiful shade of blue. People (maori) eat snapper from it. Human excrement contains microbial contaminants that cause ill health. It is top priority to collect, transport and treat human excrement away from areas of human habitation or play. Rationalisation Because stormwater dilutes the sewage when it rains, and nobody swims in the Viaduct when it's raining anyway, there are no health effects. Human excrement contains microbial contaminants that cause ill health. It is top priority to collect, transport and treat human excrement away areas of human habitation or play. Self-aggrandisement Auckland shares top billing in most global indicators for liveability. New Zealand is known by its brand as 100% pure. The sky is blue. The sea is blue. The grass is green. The people always smile. We know that human excrement contains microbial contaminants that cause ill health. We know Auckland's sewer systems are old, decrepit and leak. It is top priority to remedy this. Attributional egoism "The harbour’s deep navigable channels and sheltered bays helped to determine the choice of a site for New Zealand’s capital in 1840.... Spotlight on beach water quality. ...beach water quality for the Waitematā harbour ... web based and accessible by the public .... this model will help inform the public of the associated health risk when swimming at beaches within the harbour...." Human excrement contains microbial contaminants that cause ill health. It is top priority to collect, transport and treat human excrement away from areas of human habitation or play. Entitlement "OF THE NINE BATHING BEACHES TESTED DURING SUMMER 2013/14 95% passed RECREATIONAL BACTERIA GUIDELINES"
. Spotlight on beach water quality. "...grades represent an average of the results from the individual sites. Individual site results will vary and localised issues may not be represented by the overall grades....." Human excrement contains microbial contaminants that cause ill health. It is top priority to collect, transport and treat human excrement away from areas of human habitation or play. Anxiety What if our worst localised sewage overflow issues were featured on the front page of the The News of the World, The Wall Street Journal, People's Daily, The Sydney Morning Herald? Better to measure less and headline good news statistics. Human excrement contains microbial contaminants that cause ill health. It is top priority to identify major sources, contain leaks, publicise detailed information, budget repairs. I have chosen wastewater here. But I could just as easily have chosen rates, roading, rubbish, debt, public space, green space, you name it. And I haven't even begun to write about equity, fairness and democracy. Urban issues make big and easy targets. But what really matters is something far more profound and important. When we design our cities, when we design policies for our cities, we are building a city culture that shapes and nurtures our children (who have no choice where they are born). The city culture will also attract visitors (who generally choose the city that meets their needs). Wisdom and wise decisions build wise cities that produce, instill and attract wisdom. I'm writing to you because of the differences I am discovering between the urban design of Wellington and the urban design of Auckland, and because I want the best urban design for Auckland as it regenerates, redevelops and rebuilds. In a nutshell, what's bad about Auckland's urban design is reflected in the public amenity that was built on Princes Wharf, and what's good about Wellington's urban design is the public amenity that has been built on its waterfront over a similar planning period. Urban designers and architects were engaged by Auckland regulatory authorities during the planning and consenting stages of Princes Wharf. Their involvement and sign-off did play a critical role in the outcomes that are on display on Princes Wharf. But the fundamental influences for the imbalance between private benefit and public benefit outcomes was weak planning on the part of Auckland Regional Council, increased rates revenue priorities for Auckland City Council, and the pursuit by Ports of Auckland Limited of its corporate "successful business" objective. 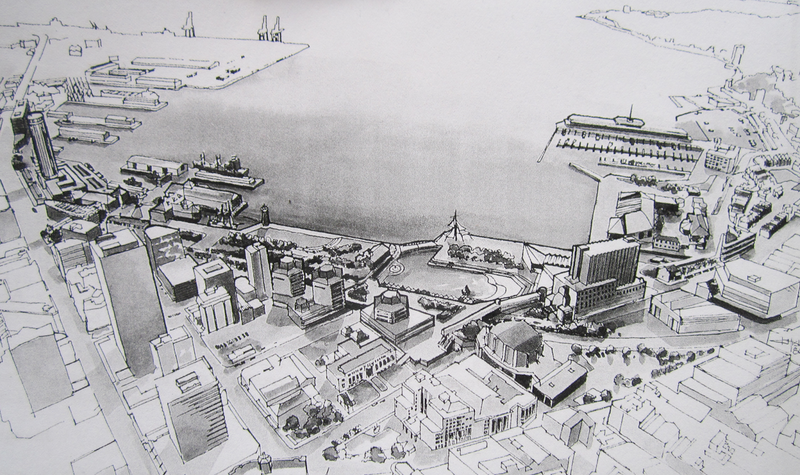 Similar temptations existed for Wellington City Council and Ports of Wellington Ltd, but the planning environment there evolved differently from Auckland's - despite much the same legislation being in place. This was primarily because of the engagement over time of its professional urban designers, landscape architects, architects and planners - sometimes formally, sometimes through structures rather like Auckland's Urban Design Panel, and sometimes informally. Whistle blowers. I am writing to you today because I am concerned you may be playing the same role for Precinct Properties regarding its Downtown development proposals, as did the professionals who were engaged in assessing Kitchener Group proposals for Princes Wharf 15 years ago. This thinking is in line with The Auckland Plan, which: “Demands good design in all development”; “Realises quality compact urban environments”, and “Seeks to create enduring neighbourhoods...."
The review undertaken by the panel is not limited to the scope of the District Plan, but is intended to encourage best practice approaches to development, specific to a site’s context, that support the overarching objectives of the Auckland Plan; recommendations from the Panel are to assist Council officers in forming their professional opinions with respect to a proposal and the requirements of the District Plan. The Panel may also make recommendations to the Council for regulatory changes, decision-making on modifications to infrastructure or development on sites that may be outside the scope of an application itself, but should be considered for the benefit of creating a quality urban environment. In reviewing proposals the Panel will focus on the appropriateness of the building or development in relation to its physical, social and cultural context.... In striving for excellence in design the Panel will consider the overall quality of the development and its architecture, as well as its appearance from the street and public spaces, and contribution to the sustainable development of Auckland. There is growing public interest in Auckland's downtown area and how it might be developed. Auckland Council is currently engaging the public about proposals for public spaces that might be paid for through the sale of Queen Elizabeth Square (a proposal which itself has not been canvassed with the public). 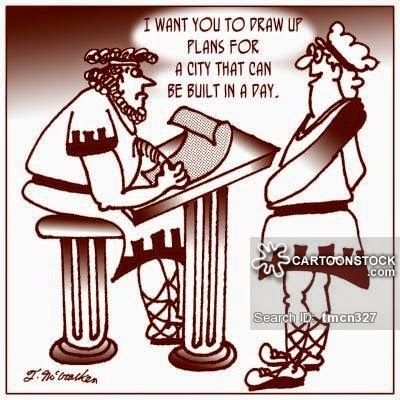 Auckland Council has prepared - but not consulted - its "Downtown Planning Framework". This is not a masterplan, it is a collection of ideas which are largely unfunded, and which lacks credibility particularly because of its inadequacy regarding bus transport planning. I am personally acquainted with many members of Auckland Council's Urban Design Panel, and trust you not to rubber-stamp Downtown proposals without giving them your full professional attention. But in the absence of a plan change for the area, robust downtown master-planning - particularly in regard to the public realm and passenger transport operations, it will be challenging to deliver the promises and potential contained in your terms of reference when assessing Precinct Properties proposals in isolation. Right from the start of waterfront regeneration, Wellington's professional urban designers, planners, landscape architects and architects have got involved, and sought to shape public opinion and Council decision-making. Various high rise buildings (eg the round tower to the left, and the substantial highrise near the proposed National Museum), intensive housing and other private developments are shown, along with green areas, open spaces, enclosed water spaces and waterfront promenades.The Gabites Porter work resulted in the Lambton Harbour Combined Scheme for the area being notified. Among other things - and thanks to enormous efforts on the part of WCC planning staff and robust public submissions - the maximum heights and bulk of various towers were reduced, and then the newly formed development agency - Lambton Harbour Development Ltd (LHML) - got down to its work. One of its first projects that did not use existing buildings was on Queens Wharf and was the Events and Retail Centre. It caused a public backlash in 1995, and in 1996 LHML called a public meeting in an attempt to allay public disquiet. This led then Mayor Blumsky to call for a moritorium on further development pending a thorough community consultation exercise. both the WCC District Plan and the Lambton Harbour Concept Plan need to be revised to take account of this report's recommendations...."
In strategic response to the CCC recommendations, a Design Review was also conducted under WCC's control. This was partly in response to the CCC repport but also responded to public submissions to Variation 17 which related to the area, and was conducted by a team of about a dozen architects, planners, policy analysts and urban designers for Wellington City Council. 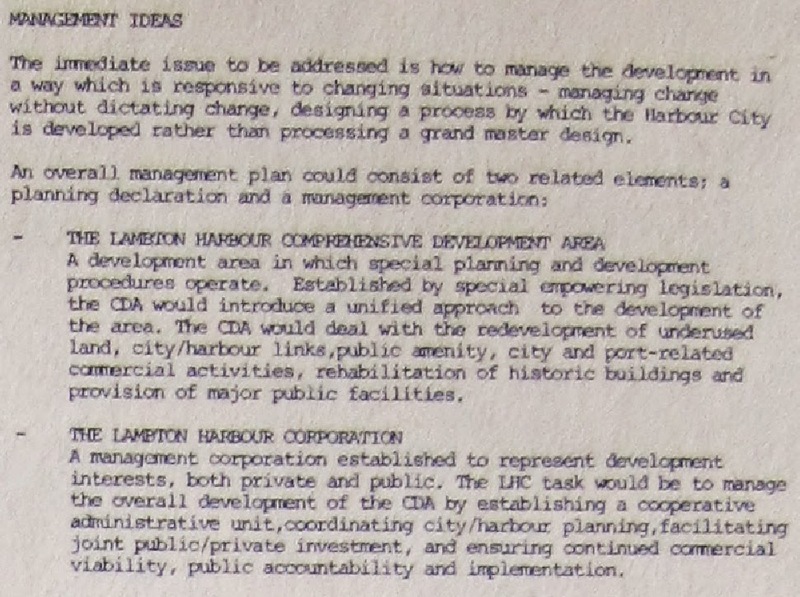 The Design Review was completed in 2000 and begins by quoting the vision that the CCC came up with in their 1996 review: "Lambton Harbour is a special place that welcomes people to walk our waterfront history through an exciting playground of beautiful and inspiring spaces that connect our city to the sea, and protect our heritage for generations." The importance of buildings working in partnership with open space to provide definition and shelter, generate life and vitality and allow differentiation between a range of spaces is a core requirement to create a high quality public environment on the waterfront. I'll stop with this bit of Wellington planning history here. My concern is that we need this sort of integrated engagement here in Auckland for our CBD urban regeneration project which extends from Princes Wharf to Captain Cook Wharf, and from the various wharves and water spaces to Custom Street. This picture is of Takutai Square. It's in the heart of Auckland CBD - part of the Britomart development. I've cut the picture (above) from the front cover of Auckland Council's Urban Design Panel publication which contains the Panel's terms of reference. Takutai Square - a small piece of green space and an interesting fountain feature - is a well used and successful part of Auckland CBD's parks network. Perhaps Auckland Council considers it an exemplar of good inner city urban design. The arrow points at the green space area of Takutai Square in this aerial of Auckland's downtown CBD. You can just see the footpath that bisects the green space. It's a small park area. Much smaller than Queen Elizabeth Square - which - in my view - needs to be the subject of a rethink and design competition to turn it into another successful piece of Auckland CBD's parks network. Submitters on the “quality parks, open spaces and community facilities created for people to use and enjoy” priority in the Waitematā Local Board Plan felt that more attention needed to be given to improving and increasing outdoor areas and facilities, given the projected increase in population and in particular the number of young people predicted to live in the city centre. This feedback is particularly wise because it draws attention to the needs of the 20,000 or more citizens who will be inner city dwellers - without backyards, without greenspaces, without outdoor places to play - and that this infrastructure needs to be planned for and provided. Waterfront spaces and places will be great, but they will not meet the needs of what is required within CBD's increasingly populated confines. Spaces and places that are sheltered from the wind, with good shade from the sun, and that are well contained and activated by the built environment are a critical component of Auckland CBD infrastructure. Auckland needs more public squares and green spaces of all sorts and shapes and sizes. I understand a number of Auckland Council's parks staff attended an international conference recently where delegates were given the message: more people living in built up urban environments means more open space and green space is needed to meet recreational and social needs that cannot be met in confined private living settings. The message is: don't sell public space. If you do you'll never get it back. It seems this lesson is being taken on board in the regeneration of Wynyard Quarter - it is a lesson that needs to be prioritised now in regeneration planning for Downtown Auckland. To get a flavour of just how much public money has, and is being expended by Auckland's 100% ratepayer owned Ports of Auckland Ltd in subverting the Unitary Plan in its own interests, I suggest you take a quick look at POAL's first written submissions. But only if you are ready to read 453 pages prepared for POAL by its lawyers: Russell McVeagh (ALB Dealmaker of the Year, New Zealand Deal of the Year, Australasia Equity Deal of the Year 2013....). POAL has always wanted to expand its reclamation, and it sees the Unitary Plan as its best (and maybe last) opportunity to get Auckland Planning Systems changed, so future reclamation is easy and possible. Before I get into the guts of this posting - which is to ask the question of Auckland Council: "have you given permission to your 100% publicly owned POAL to spend in excess of $1,000,000 of ratepayer money subverting your Unitary Plan?" - another RMA point. My understanding of the environmental effects that the RMA was set up to control (avoid, remedy, mitigate) include cumulative effects. Why would Auckland Council give POAL a general licence to reclaim in future without previously satisfying itself that the cumulative effects of more reclamation are less than minor? There's a lot of chat out there about what's going down in the Unitary Plan submissions and hearings process. I'll write more broadly in future. But for now I want to focus on the effort that POAL is putting into supporting its position and submissions at the hearings. It sounds like POAL is throwing the kitchen sink at it - at ratepayer cost. Its Russell McVeagh attack team is headed by none other than RMA guru Derek Nolan. Their presence at the hearing seems calculated to challenge and threaten even before words have been exchanged. The Russell McVeagh legal team heft in cardboard cartons of papers and submissions. Especially intimidating when you're on the receiving end, or making counter submissions. "Drown the bastards" - is the motto. And each one of those documents has been carefully prepared by a team of lawyers and checked over by Mr Nolan, no doubt, while the clock ticks away, the hours add up, and POAL pays up, eating into the dividends that might be available to Auckland Council for other purposes. The irony is - of course - that Auckland Council's team of planners and lawyers more or less know what POAL and Russell McVeagh are trying to achieve, and so they, in turn, spend hours and hours, and thousands of ratepayer dollars on writing other submissions and arguments providing counter or supporting arguments, or who knows what, to POAL's submissions. Given what I know of Derek Nolan, he'll be having the time of his life. Perhaps a hefty new reclamation permit will be Russell McVeagh's next "deal of the year". I can almost hear POAL executives telling Derek, "fill your boots". But is all of this really in the public interest? Does Auckland Council exercise any control over POAL through its intermediary Auckland Council Investments Ltd (ACIL)? (NB: It was interesting to note that in the recent CCO review, a wise decision was made to take back into Council's Treasury from ACIL the diversified fund portfolio which I understand amounts to around $200 million - though I would be concerned if this was suddenly tipped into the CRL without public discussion.) Wouldn't it be appropriate for Auckland Council to set some sort of limit on legal actions against Council plans on the part of entities and CCOs it owns and governs? A question that lies unanswered is this? Why does POAL need all this reclaimed land? 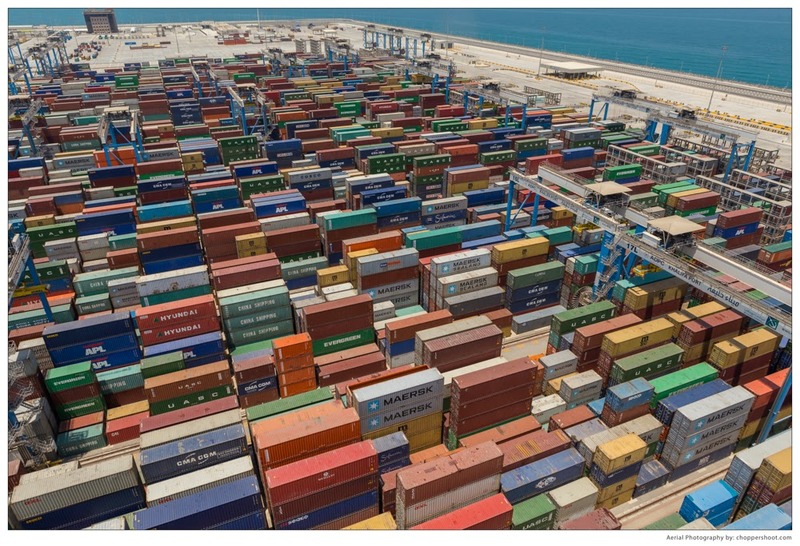 How much profit or margin is earned by POAL through being a property developer rather than a port facility? Last week I learned that POAL has done a deal with HOLCIM cement to develop a huge cement and concrete facility on reclaimed port land in downtown Auckland. It appears that an opportunity has arisen (HOLCIM is involved in discussions with Westport and Oamaru and the Onehunga Port about where to locate its facilities and operations which may rely on cement imports from Australia - details unclear so far), for POAL to offer HOLCIM a fantastic deal to relocate to downtown Auckland. Like the deal POAL offered Maersk Shipping - the cheapest berthage rates in Australasia - to get as many ships in the port as possible. And all of this economic activity is subsidised in some way or another by Auckland. Do we really want an industrialised concrete factory in the heart of downtown Auckland with all the concrete truck movements associated? Do we really need to look out over a growing concrete factory on the waterfront? Isn't it about time POAL paid the true costs of its occupation of public land on the waterfront. Isn't it about time Auckland and Auckland Council stopped subsidising the growth of this cuckoo? At its Governing Body meeting of 27 November 2014, Auckland made decisions that followed from a lengthy review of Auckland Council CCOs. Decisions included several that initiate the establishment of a new CCO that will engage in urban development and regeneration projects. The meeting report (see here from page 193 onward) states: "The most significant recommendation of the review is to include in the LTP a proposal to establish a new CCO to deliver on council’s urban development outcomes. The proposal includes bringing together Waterfront Auckland and ACPL to form a new urban development agency. It is necessary to consult on this proposal as the establishment of new CCOs triggers the need for consultation. This proposal also signals an increase in activity in brownfield redevelopment." What this means is that the Council's Long Term Plan - a Draft of which is being prepared at present for consulation early next year - will contain a "statement of proposal" relating to "Development Auckland" (the interim name proposed for the CCO) and will seek public submissions. I have long believed that Auckland needs some sort of Urban Redevelopment Agency approach. It is not enough to simply promulgate a Unitary Plan and leave implementation to the market. The reason there are so many critical submissions to the Unitary Plan (from communities fearful of intensification) is that little thought has gone into planning implementation (whether its social or network infrastructure, changes in land use, community development). This flies in the face of urban redevelopment experience around the world in cities that are older than Auckland (most are), and that have been there, done that. I provided some planning background to that in this posting, which summarises the learnings from a Joint Council study trip to Perth some years ago. So Auckland Council's decision is good news I think, but there are some fish-hooks. The first and most obvious to waterfront observers is the risk to delivery and continuation of the direction and programme of works and development that have been managed by the Waterfront Auckland Development Agency (AWDA). It is appropriate to harness the skills and approach to brownfield redevelopment that have developed in AWDA, and to apply those skills so other parts of Auckland can benefit, but that should not threaten or reduce the quality of what is being achieved at Wynyard Quarter, which is really only just past the start of what will be a 20 year project. 29. The best examples of urban development agencies overseas also focus on lifting the socio-economic status of the local communities undergoing redevelopment, by building in opportunities for job creation and the provision of social services. It is extremely likely that over time council will also need to work in locations where a high degree of this broader activity is necessary. In the establishment phase of Development Auckland, the focus will be firmly fixed on building capacity and capability to deliver physical redevelopment in brownfield locations. 30. International best practice also shows that having a balanced portfolio of redevelopment locations can be beneficial – those that have the ability to generate a surplus, and those that do not but are still important for other reasons. Staff will consider this and a number of other matters when undertaking location intervention analysis and in recommending the best locations for council approval for Development Auckland to operate in. 31. It is envisaged that location intervention analysis would be led by council staff with input from many parties including Development Auckland staff. Once locations had been approved by council and the Board of Development Auckland, the masterplanning and business case process would be led by Development Auckland staff with council staff input. 32. Over time it is also likely that Development Auckland will build a more sophisticated understanding of property and development dynamics in the Auckland market. Since it will become a key player in this market, it will seek to foster learning within the broader development industry wherever possible. Point 29 (above) points to another potential fish-hook. My research strongly supports the idea that "best examples" of urban regeneration include: "building in opportunities for job creation and the provision of social services". This is partly what we see at Wynyard Quarter where there is a place-making balance between marine industry, fishing industry, residential development and commercial development - though there is still insufficient emphasis there on social services such as a primary school, kindergarten, library or community centre. However Point 29 goes on to state: " the establishment phase of Development Auckland, the focus will be firmly fixed on building capacity and capability to deliver physical redevelopment in brownfield locations..". This is problematic I think, and suggests that the main driver for the establishment of Development Auckland is to satisfy the housing supply aspirations of the Hons Nick Smith and Bill English. Their political objectives and assumptions - that housing supply is the only problem, that economic growth trumps all other issues - are highly ideological and questioned by many commentators and economists. I would be very concerned if Development Auckland is established to PRIMARILY focus on building houses (not communities) in Special Housing Areas. That it is PRIMARILY established to facilitate getting house-build runs on the board for central government. I make this point strongly because of the headline that accompanied Council's announcement of the Development Auckland decision. This reads: New agency to fast track urban development. This suggests an altogether different agenda from that recognised in Point 29 above. Maybe Auckland Council needs to satisfy Central Government Ministers, but that should not compromise objectives to build complete communities through genuine place-making approaches. I generally agree with the planning process that is suggested: That Auckland Council develops an Auckland redevelopment implementation strategy, and prepares high level masterplans (which could be like the Urban Design Framework that was prepared by Councils for Wynyard Quarter) for specific areas, leaving the Development Agency to work with local communities to develop detailed masterplans - including infrastructure requirements (which would need to be funded through development levies or value uplift related revenues). The final fish-hook. Nowhere do I see any mention of how the regeneration and redevelopment of Downtown Auckland will be handled. The documents are silent on QE Square, Precinct Properties, Quay Street, and all the rest. But the Downtown Auckland project is as important to Auckland City as Britomart was, and as Wynyard Quarter has become. It is the most significant brownfield development project for the Auckland Region. It is the heart of Auckland. It might not be about building houses quickly for Bill and Nick, but it is of critical importance to all of Auckland. It needs a Development Agency focus to deliver optimum public, private, long-term sustainability. In this post I question Auckland Council's compliance with the Local Government Act and with its own recently agreed policies for public engagement and significance. The example I will use is the proposed privatisation of Queen Elizabeth Square. Previous blog postings (here and here) and media articles have described Precinct Property proposals to redevelop its land interests in Downtown Auckland. Precinct Properties owns the two existing towers on the land (Zurich Tower and HSBC tower) and the old Downtown Westfield Shopping Centre. The land is part of Auckland's Downtown Precinct. It is a sub-precinct. There has been discussion about the possibility of selling, or otherwise providing opportunity for developing, publicly owned land that is part of this sub-precinct - land known as Queen Elizabeth Square - land which is presently zoned "road". There's a few pictures of it here. This square was a Council creation back in the 1970's when the downtown area was developed with the HSBC Tower (then known as the Air NZ Building) and the Westfield Shopping Centre. The development replaced old Auckland buildings and a not-so-small street called Little Queen Street. The combined land area of the street that got developed over was about 2000 square metres. (There is a very useful and readable article about Auckland's Downtown development during that period in a recent issue of Architecture Now magazine.) The land area equivalent was retained in public ownership in the form of QE Square. This is one of the reasons why QE Square did not have a lot of love lavished on it when it was first built. It was essentially land left-over from private development. So it's not surprising that it has not been that successful. So far. That's a quote from the Proposed Unitary Plan that is being heard and discussed now by commissioners. It sets out requirements in the event QE Square is reconfigured in any way. Planners writing that provision clearly understood there was a possibility that the Downtown Precinct would be redeveloped in the future, and that it might be a good idea to reinstate the old street network or any one of many other possibilities. But it would have to be within the precinct. The Unitary Plan cannot require or anable the Council, or any other body, to do something outside the site, because of something that happens within the site. The Unitary Plan comes with various factsheets to explain terms, including this one which explains what a Framework Plan is: "a framework plan is a voluntary resource consent that enables land owners to demonstrate and achieve integrated development within brownfield or greenfield areas....framework plans can apply within precincts... they ensure place-based provisions apply to an area over and above zone provisions...an approved framework plan may contain locations of roads and open spaces within a precinct or sub-precinct..."
So. Reading these provisions you could be forgiven for coming to the conclusion that any change involving changes in the use or disposition of QE Square land must be within the subprecinct that is the subject of the framework plan relating to Precinct Properties development land interests - ie within the rectangular land area bounded by Custom Street, Lower Albert Street, Quay Street and Lower Queen Street. In this case it seems probable that there are two land-owners: the Council and Precinct Properties. Precinct Properties must obey the law of the land, and comply with the Unitary Plan, and of course it must satisfy its shareholders. But what about Auckland Council? Who or what must it satisfy, if it wants to sell or change the use of Queen Elizabeth Square? Can it legitimately trade away QE Square for another piece of road or wharf space somewhere else? There is a lot of detail about how decisions should be taken, how meaningful consultation should be organised and other matters. The Act also talks about "significance" and "engagement". (d) how the local authority will engage with communities on other matters. (3) The policy adopted under subsection (1) must list the assets considered by the local authority to be strategic assets. "For Auckland Council, engagement is a genuine dialogue between decision-makers, communities and stakeholders for the purpose of making better decisions, policies or programmes of action..."
In compliance with s.76AA(3) above, the engagement policy does provide a list strategic assets. These include airport and port shares. They include the water and wastewater network. And they include parks and roads. But they carefully use the words: "road network" and "parks network", and define the word "network" to mean the whole network. Which is a cunning way of excluding from the strategic asset list anything that might be just a part of the network. Does this permit Auckland Council to privatise a piece of road or a piece of park without going through the accountability and democratic decision-making processes that are the purpose of the Local Government Act? “Downtown Auckland will be transformed over the next decade, and that includes a really exciting opportunity for much more attractive, vibrant, useable public spaces. This will benefit all those who live, work and study in the city centre, as well as businesses, visitors and shoppers...."
What do you want most from public spaces in downtown Auckland? Auckland’s downtown will be transformed over the coming decade with better transport, more attractive streets and new buildings. The plans also include new and better public spaces. The sale of Queen Elizabeth Square will enable the creation of a new space on lower Queen Street, and will fund the development of two new waterfront spaces without drawing on ratepayer funding. Further potential spaces are being considered and your opinions will help that planning. We want to hear from you about what you would like most to be doing from Lower Queen Street through to the waterfront areas between Prince’s Wharf and Captain Cook’s Wharf...."
Remember we're talking here about "genuine dialogue". "Before the council makes a significant decision, the council will consult the public, following the principles set out at section 82 of the LGA...". These include: "...listen to, and consider those views, with an open mind...". That would usually mean you hadn't already made up your mind. From which funding source should Precinct Properties be compensated for the loss of basement car-parking in its proposed Downtown tower development that will be caused by the Britomart/CRL rail tunnel? What options exist and which is preferred for relocating QE Square space elsewhere within the Downtown subprecinct in accordance with Unitary Plan provisions? How will equivalent or better bus interchange services that replace those displaced from Lower Queen Street be provided without degrading existing pedestrian amenity? What minimal cost options exist for simply re-allocating existing waterfront public owned road or wharf space to public pedestrian uses - irrespective of proposed Downtown development? Should QE Square land be sold at all, and what should that revenue be used for? What options exist for improving QE Square? Council has got itself into a serious public policy corner. Quite apart from severely challenging the purpose of the Local Government Act, manipulating its own Unitary Plan provisions, and acting in a self-interested manner (conflict of interest), it opens itself up to public criticism because what the people are being consulted about amounts to window dressing, re-arranging deckchairs, applying lipstick, whatever. It is an insult to public intelligence. This is not "genuine dialogue" at all.